From Chow– a Great website for food info, how-toes and recipes. This is one of the dishes I will be making f0r the Meal Delivery Service, it’s a favorite of mine. Heat a gas or charcoal grill to medium high (about 375°F). Brush both sides of the steaks with butter and season well with salt and freshly ground black pepper. Let steaks rest at room temperature at least 15 minutes before grilling. When the grill is heated, place steaks on the grate and close the lid. After about 4 minutes, rotate steaks a quarter turn to create crosshatched marks. After another 3 to 4 minutes, flip steaks over. After another 4 minutes, rotate steaks a quarter turn and grill to desired doneness. (It will take about 15 minutes of total cooking time to reach an internal temperature of 130°F for medium rare.) Remove steaks from the grill and let rest 7 to 10 minutes before serving. 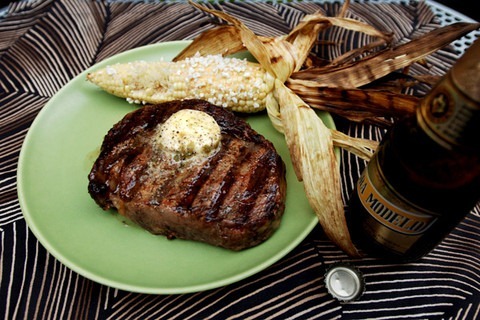 To serve, slice compound butter into six rounds and top each steak with a round.